Home 7thCPC Allowances DoE Orders Extra Work Allowance MoF ORDERS Grant of Extra Work Allowance - decision of the Government on the recommendation of the Seventh Central Pay Commission (7th CPC). Grant of Extra Work Allowance - decision of the Government on the recommendation of the Seventh Central Pay Commission (7th CPC). 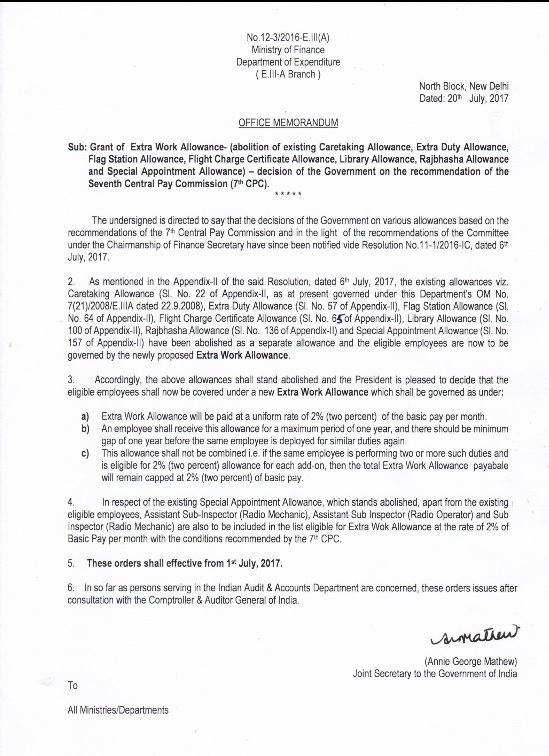 Sub: Grant of Extra Work Allowance- (abolition of existing Caretaking Allowance, Extra Duty Allowance, Flag Station Allowance, Flight Charge Certificate Allowance, Library Allowance, Rajbhasha Allowance and Special Appointment Allowance) - decision of the Government on the recommendation of the Seventh Central Pay Commission (7th CPC). 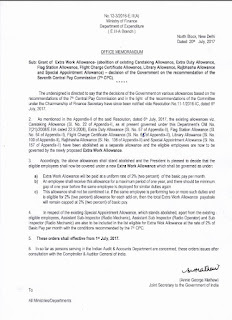 The undersigned is directed to say that the decisions of the Government on various allowances based on the recommendations of the 7th Central Pay Commission and in the light of the recommendations of the Committee under the Chairmanship of Finance Secretary have since been notified vide Resolution No.11-1/2016-IC, dated 6th July, 2017. 2. As mentioned in the Appendix-II of the said Resolution, dated 6th July, 2017, the existing allowances viz. Caretaking Allowance (SI. No. 22 of Appendix-ll, as at present governed under this Department’s OM No. 7(21)/2008/E.IIIA dated 22.9.2008), Extra Duty Allowance (Sl. No. 57 of Appendix-ll), Flag Station Allowance (SI. No. 64 of Appendix-II), Flight Charge Certificate Allowance (SI. No. 65" of Appendix-ll), Library Allowance (SI. No.100 of Appendix-II), Rajbhasha Allowance (SI. No. 136 of Appendix-ll) and Special Appointment Allowance (SI. No. 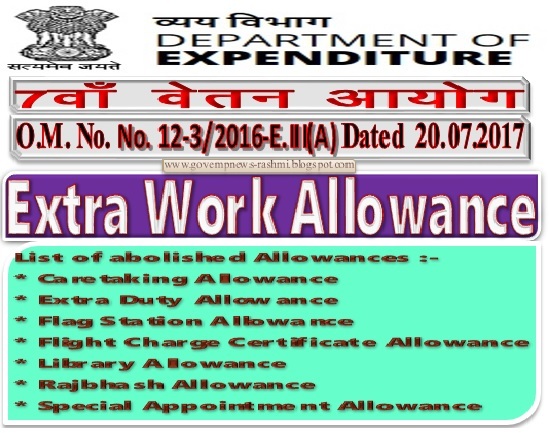 157 of Appendix-II) have been abolished as a separate allowance and the eligible employees are now to be governed by the newly proposed Extra Work Allowance. b) An employee shall receive this allowance for a maximum period of one year, and there should be minimum gap of one year before the same employee is deployed for similar duties again. c) This allowance shall not be combined i.e. if the same employee is performing two or more such duties and is eligible for 2% (two percent) allowance for each add-on, then the total Extra Work Allowance payabale will remain capped at 2% (two percent) of basic pay. 4. 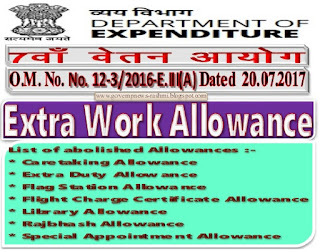 In respect of the existing Special Appointment Allowance, which stands abolished, apart from the existing eligible employees, Assistant Sub-Inspector (Radio Mechanic), Assistant Sub Inspector (Radio Operator) and Sub Inspector (Radio Mechanic) are also to be included in the list eligible for Extra Wok Allowance at the rate of 2% of Basic Pay per month with the conditions recommended by the 7th CPC. 6. In so far as persons serving in the Indian Audit & Accounts Department are concerned, these orders issues after consultation with the Comptroller & Auditor General of India.